If you subscribe to ETCetera, you will have read in the latest issue about the confirmation of a Sun No. 1 model.1 That model, featuring a different inking system, is displayed in the Sun logo. Unquestionably, ribbons proved the best, most economical, method for applying ink to a page — various other systems never gained traction — so that someone would modify this Sun No. 2 (pictured above) seems logical, though, in terms of collectibility, rather unfortunate. Click on image to enlarge. Ribbon spools were added at some later date, though no advancing mechanism is apparent. To view the item, for sale on Etsy, visit this link. According to the Etsy seller, “The system was added by local engineer later on. [S]o the mechanism was principally re-built to accept more common ribbon.” He did not explain how the ribbon advances. I suppose the operator would have to advance the ribbon manually, by hand. Had someone made this modification in the early 1900s — and such could be demonstrated — this would be a rather interesting item. That ribbons were added “later on” (how much later?) leaves it somewhat mutilated. 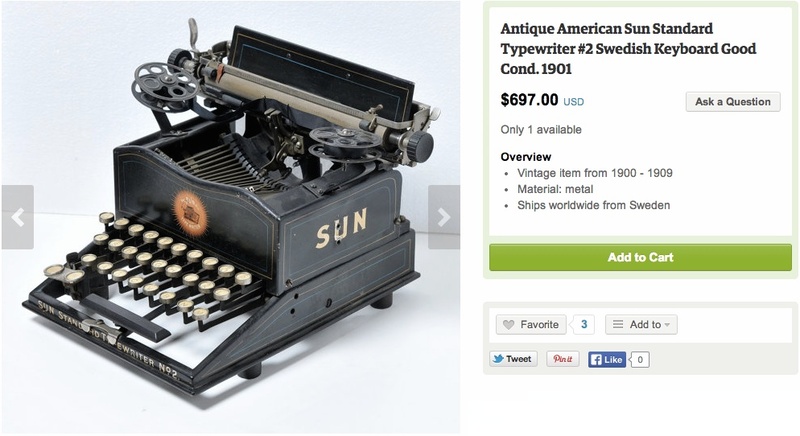 Previous post: How dost thou price thy typewriter?